Sam from the Ewanrigg Local Trust is here at the centre every Wednesday 1pm – 3pm in the computer room. If you need help identifying your key strengths, writing a CV or would like to know what oppertunities in training/jobs/volunteering are out there then come and have a chat. You can use the centre's computer room during this time to update your job search, and even use the ELT mobile phone to contact employers. 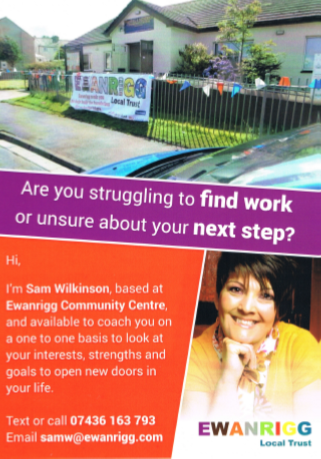 Even if you just want to discuss your future and how you can get into the world of work, Sam will help you through the steps it takes to get there. Completely free and no need to book.